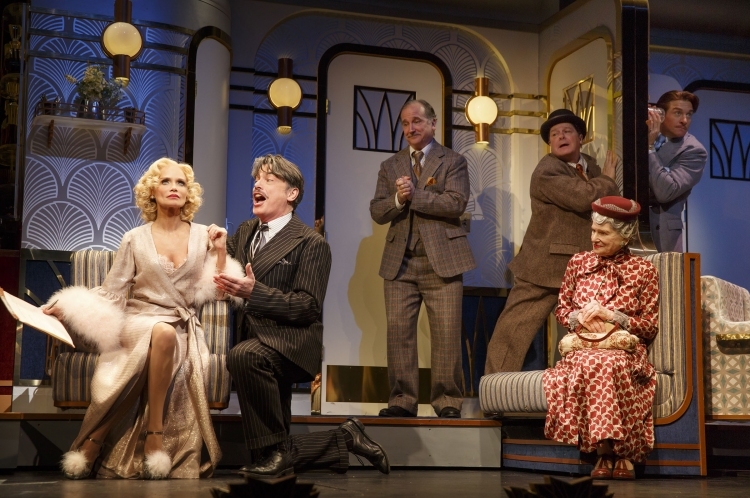 All aboard for a generous slice of music theatre heaven as Roundabout Theatre Company revive decedent backstage musical On The Twentieth Century. A charming companion piece for On The Town (they even sit side-by-side on 42nd St), 1978 Cy Coleman musical On The Twentieth Century is a delectably daffy return to the heyday of glamourous train travel. Producer Oscar Jaffee uses the 16-hour Chicago to New York journey on the Twentieth Century to entice former muse Lily Garland back to headline his next play. The show is testament to the lengthy careers of book and lyric writers Betty Comden and Adolph Green, coming some 34 years after they penned On The Town. It also shows how their skills at running jokes had improved in the interim; the gag about everyone having written a play pays dividends. Coleman adopted an operetta-like style for the score, writing around twice as music as for similar musicals, and providing a strong early example of songs that advance the plot. 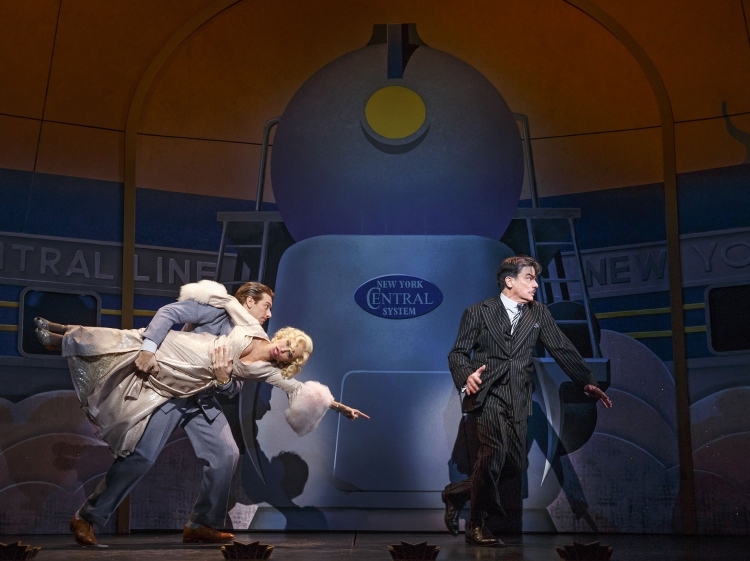 While most of the show is set on David Rockwell’s sumptuous art deco train interior, the storytelling is enhanced with a couple of fabulous cutaway numbers. In a sequence reminiscent of Mack and Mabel, we see Jaffee discover awkward Mildred Plotka and soon she is glamourous Lily Garland starring in farcical French musical “Veronique.” In act two, “Babette” sees Lily imagine herself squeezing elements of Mary Magdalene into a rival producer’s new play. Costume designer extraordinaire William Ivey Long distinguishes himself yet again as he continues the art deco theme with a dishy array of fabulous fur-trimmed period outfits. Lily’s magical fast change, a characteristic feature of Long’s work, is achieved with characteristic flair. Four sensational tap-dancing porters get the best of the Warren Carlyle choreography. Entertaining company numbers, such as “Never” and “She’s An Nut” feature nimble big picture choreography of scenic elements and the ensemble cast. Reduced to thirteen players, the orchestra is a little thin for the demands of the score. The coming cast recording, however, will be most welcome. 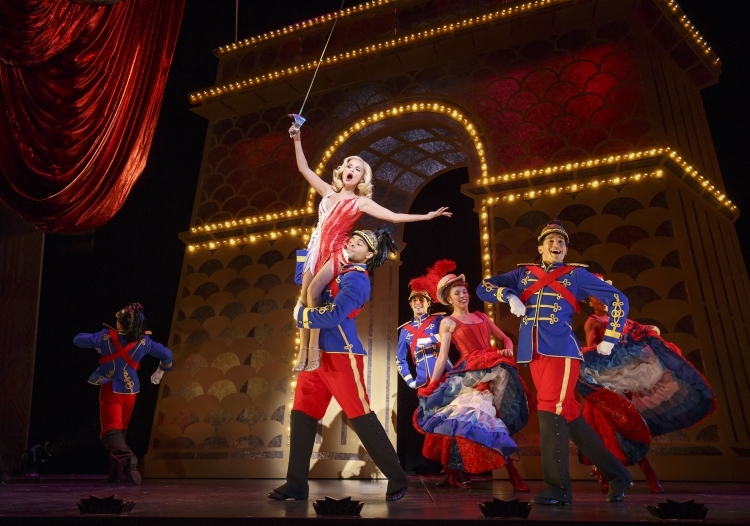 A successful screen artist making a return to the stage, popular star Kristin Chenoweth plays Lily, a successful screen artist making a return to the stage. The role provides abundant opportunity for Chenoweth to display both her crystalline soprano and her delightful comic skills. Her characterisation of stiff, bossy Mildred is a hoot, and she enjoys clear chemistry with both her leading men. 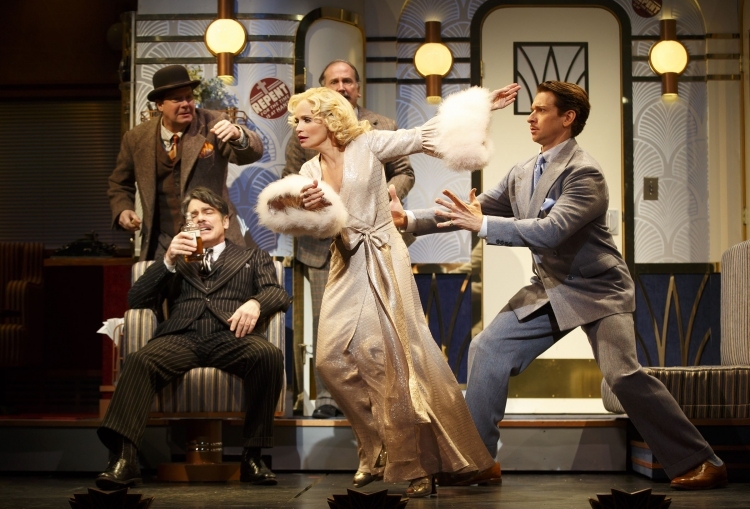 Seeing Chenoweth in full flight here is on par with Idina Menzel’s star turn in If/Then last season. Stellar leading man Peter Gallagher neatly offsets Chenoweth’s madcap energy and keeps the comedy grounded with a deftly understated characterisation of passionate producer Oscar Jaffee. Gallagher’s singing voice retains its charming, almost Sinatra-like casual masculinity. Andy Karl makes good use of the muscles he put on last season as Lily’s vainglorious boyfriend Bruce Granit. Mary Louise Wilson is a hoot as delightfully dithering dame Letitia Peabody Primrose. Michael McGrath is not quite given the meaty comedy that helped win a Tony for 2012’s Nice Work If You Can Get It, but he and Mark Linn-Baker provide much of the comic foil work as grasping showbiz types Owen and Olive. On The Twentieth Century is manna from theatrical heaven for lovers of classic musical theatre. Don’t miss the train. 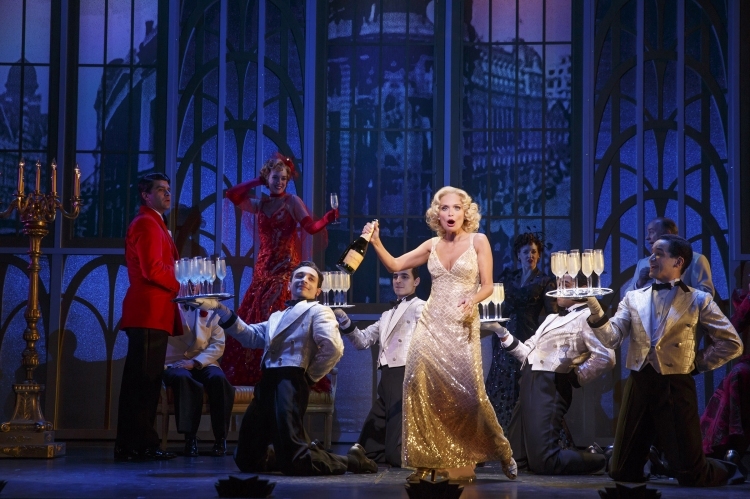 On The Twentieth Century plays at American Airlines Theatre until 5 July 2015. April on Broadway for me is like December at the movies for you Mark – so many great new titles to see! Glad of the sunny weather today, hoping for more over the next two weeks. Have to see if there is a good show for you to catch this season on Broadway. Will keep this in mind as I watch all the new ones. Today’s show was in the same theatre as Violet. More lavish and less dramatic this time though!